Adele Blanc-Sec is a freelance writer who operates in Paris, first before World War I, then in the 1920s. In her adventures, she faces mad scientists, secret sects of demon worshippers, Egyptian mummies brought back to life, and a host of other weird creatures. The first Adele Blanc-Sec story was originally serialized in the daily newspaper "Sud-Ouest" in 1976. 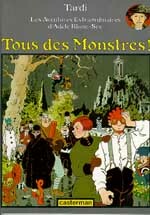 It was then collected in a graphic novel by Belgian publisher Casterman. 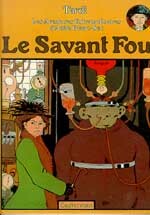 Later stories were first serialized in Casterman's monthly comic magazine, "(A Suivre)", then published as graphic novels. The Adele saga however really began with Adieu Brindavoine, serialized in 1972 & 1973 in the weekly magazine "Pilote". It told the story of a young photographer in the Europe of 1914. Brindavoine gets caught up in a bizarre odyssey that takes him to the Middle East. There, he encounters a lunatic millionaire, Otto Lindenberg, who is trying to find a worthy heir to his fortune. The story ends with the beginning of World War I. 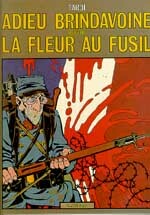 A later short story sequel, The Flower in the Rifle, was published in "Pilote" the follwing year and told more of the long-suffering Brindavoine's wartime experiences. Adieu Brindavoine sets the tone for the Adele saga. It features a combination of realistic settings and well-researched events, blended with odd characters and weirder plots. 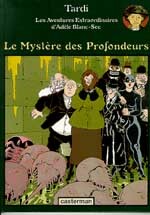 The strong anti-war, anarchistic outlook of the series remained a Tardi trademark. This mixture was even more present in The Demon of the Ice, which was released directly in album form by "Pilote"'s publisher Dargaud in 1974. 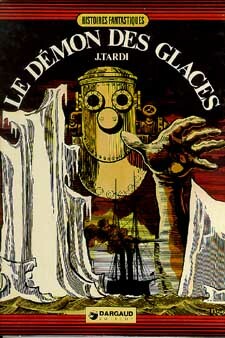 In this deliberate homage to Jules Verne, Tardi told the story of mad scientist Carlo Gelati and his secret sea fortress, disguised as an artificial iceberg. The story takes place in the 1890's, and Gelati's arch-enemy, Simone Pouffiot, clearly anticipates Adele Blanc-Sec. 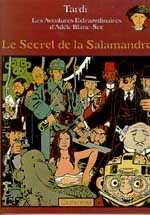 In 1976, Casterman relased the first two Adele adventures, which introduced the title character: a young Parisian writer who is not afraid to drink, shoot guns, smoke, or shoot like a man. (The character appears to be somewhat inspired by real-life writer, George Sand.) Success was immediate. 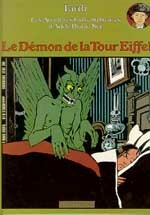 The series begins in 1911, when a sect of Parisian demon worshippers are on a spree of human sacrifices. Adele interferes and eventually defeats the Cult. At the end of the fourth album, Tardi brought back some characters from The Demon of the Ice, tying up most of the loose ends in a bloody massacre, during which Adele was fatally stabbed in the heart! Fortunately, our heroine was rescued by a young scientist who, with the help of Adele's resurrected Mummy, placed her in hibernation. In an interview, Tardi explained that Adele's "death" was necessitated by the onset of World War I. Her feisty nature made it impossible to provide her with a place in the war. She would not have been allowed to fight, and could no more have settled for being a nurse, than she could have remained home rolling bandages. Once the war was over, Adele's rescuer wound up being Brindavoine. In The Secret of the Salamander, Tardi deals with Brindavoine's post-war adventures, leading to Adele's resurrection in November, 1918. The book also features the unholy alliance of the powers of money and crime, personified by Brindavoine's nemesis, Lindenberg, and the American mafia. Adele and Brindavoine were stalked again by their old enemies and investigated a conspiracy which led them to uncover the real reasons behind World War I, as well as other strange ectoplasmic phemenons. With The Mystery of the Depths, the series jumped to 1922, introduced Adele's sister, Mireille Pain-Sec, and launched its heroine on a new quest. The saga of Adele Blanc-Sec forms an unparalleled occult history of the Belle Epoque. It playfully reveals the secrets behind historic events, always carefully explaining how these were covered up to protect the rich and powerful. Adele is only one of the fascinating and complex characters among the dozen or so that Tardi has created, and whose fates seem to be interwoven in an inexorable web. 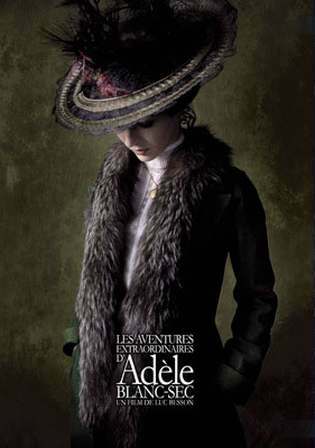 The first five Adele Blanc-Sec stories as well as Adieu Brindavoine were translated by Randy & Jean-Marc Lofficier. They were first serialized in b&w in Dark Horse's "Cheval Noir" comic, then published as graphic novels by NBM. In 2010, Les Aventures extraordinaires d'Adèle Blanc-Sec, written and directed by Luc Besson, was released. 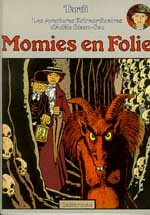 The fil is loosely based characters on Adèle and the Beast and Mummies on Parade with additional materials from Besson. The cast includes Louise Bourgoin as Adèle, Gilles Lellouche as Inspecteur Caponi, Jacky Nercessian as Professeur Espérandieu and Mathieu Amalric as Adele's nemesis, Professor Dieuleveult. Jacques Tardi's (1946- ) first comic-book story was a collaboration written by Moebius, and was published in "Pilote" in 1970. Tardi then went on to illustrate the first story in Pierre Christin's Légendes d'Aujourd'hui [Modern Legends] saga, later taken over by Bilal. In 1977, Tardi and writer Picaret created the pseudo-historical fantasy Polonius for "Métal Hurlant." In 1978, he illustrated Jean-Claude Forest's graphic novel, Ici Même [Same Here]. 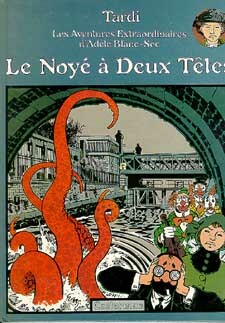 Tardi has also produced a number of graphic novels featuring French writer Léo Malet's popular hard-boiled detective, Nestor Burma, and illustrated the covers of Daniuell Pennac's Malaussène series. Adèle Blanc-Sec © 2001 Jacques Tardi/Casterman. All rights reserved.